The Optimus range of meters measure all parameters at the same time, so there is no need to spend time figuring out if you have the meter set up correctly before starting a measurement. The Optimus Green sound level meter is available as either Class 1 or Class 2 - the most common for environmental noise measurement and more accurate being Class 1. This meter also has everything needed for occupational noise measurement in line with the Noise at Work regulations, making it ideal for anybody involved in both environmental (outside the factory) and occupational (inside the factory) noise. If the meter is to be left unattended in poor weather conditions then the Outdoor Kit should be used to offer protection against the elements. The Outdoor Kit also includes a large rechargeable battery pack for at least seven days of monitoring. Most environmental noise surveys demand the use of a Class 1 Sound Level Meter that can make repeating measurements, such as the 5 minute LAeq and L90 (background noise). We recommend the Class 1 Optimus Green with Data Logging in a Noise Measurement Kit, order code CK1710). Most regulations demand the use of a suitable Calibrator, which is included with this kit. The Optimus Green sound level meter is capable of measuring the noise parameters required for most environmental noise surveys. It is ideal for both short term and longer term measurement when installed in a weatherproof outdoor kit. To keep things sensible, the meter displays just the main parameters (Leq, Ln, etc.) on its display. However, it simultaneously measures all installed parameters, so you can sure of missing nothing. These parameters can be viewed on the display or, more usefully, after download. On top of the summary data above, the meter continually stores a number of parameters, typically every second, but the rate can be between 10ms and 2 seconds. When downloaded to a computer, this gives a detailed and very useful graph of the noise levels over time. Although the Time History is not usually a requirement of the regulations, it is extremely useful when presenting a picture of the noise. It also offers the ability to zoom in on different times of day and recalculating the Leq for other time periods. Audio recording can be started manually by pressing a key or it can be triggered automatically based on the level and duration of noise events. The quickest way is to take notes about a measurement is to make a brief recording just before making a measurement. The VoiceTag stays with the measurement when it is transferred to the computer. The VoiceTag feature is included with all versions of the Optimus Green sound level meter. Before starting a measurement, the meter will ask if you want to record a "VoiceTag". The meter will record any speech or the noise in question (to help you identify it later) for up to 30 seconds. This audio is transferred to the software automatically along with the measurement. You can skip this stage if you don't need a voice tag, or the option can be disabled altogether. When viewing the measurement on a computer the Play Voice Tag button lets you listen to the recording on the computer's speakers. The Green version of the Optimus Sound Level Meter is ideal for almost any type of noise measurement, but it has been optimised for Environmental Noise Surveys. It provides all the parameters and features that are usually needed, and of course it meets the very demanding acoustic standard IEC 61672 to Class 1. Most regulations and measurement standards state that the meter's calibration should be checked before making measurements. Fit the Calibrator over the microphone as shown on the right, switch it on and press the Calibrate button. The meter will automatically make any adjustments. Calibration details are stored in the meter so that you can either make note or download them to a computer if you have the data logging option. Press the Start key, shown on the right to begin the measurement process. If you have the data logging option fitted then the meter will ask if you want to make a Voice Tag recording. The meter will start measuring the LAeq and other parameters that are needed for environmental noise surveys. When you are happy that you have measured for long enough simply press the Stop key. The meter can record the audio - so you can listen to the actual sound later. Audio recordings can be started manually or when a trigger level is exceeded. To start a recording manually press the Audio button during a measurement. The Audio Recording can be set to start automatically when a certain level is exceeded. For example, you can set it to make a recording when the level exceeds 65dB(A). You can even set it to trigger when the trigger level is exceeded in just one band to detect tonal noise. Adjustable smoothing factors are available to avoid triggering on very short term noise. For many environmental noise surveys, you need periodic (usually 5 minute, 15 minute or 1 hour) measurements showing values such as the Leq and the L90. To make this type of measurement, use the Menu key to set the meter to make repeating measurements of the required duration. The meter will now run for the specified period. It will then stop, store the results and start again automatically. It is better to mount the meter on a tripod for this type of measurement. A tripod mount is included on the back of the meter. It can be fitted to a standard camera tripod, or we can provide you with a suitable one. The meters on this page include the NoiseTools software - there is no extra charge for this. You can download the software to evaluate it before making a purchase. The NoiseTools software runs on a Windows PC. It is compatible with all recent versions of Windows, from Windows 7 onwards. The Optimus Green is already optimised for environmental noise surveys and so is adequate for most surveys without any additions. Class 1 or Class 2? - The most popular for environmental work is Class 1. Calibrator - Most regulations state that you should have a calibrator. 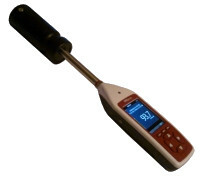 Noise Measurement Kit - These include meter, calibrator and a carrying case. The most important of the accessories is the Calibrator. Most regulations state that you should use one to check the function of the meter before making any measurements. Class 1 or Class 2? A Class 1 sound level meter is a little more accurate than a Class 2 model. It is also more expensive. For most environmental noise measurements we recommend the use of a Class 1 meter, which gives better performance at higher frequencies and certainly looks better when presenting the results for legal purposes. If you want a bit more information then please visit our FAQ page about Class / Type. The Noise Measurement Kits, order codes beginning CK..., include a sound level meter, calibrator of the correct class, software, carrying case and download cable. 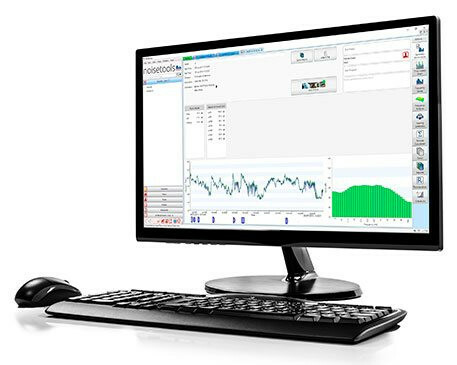 As a calibrator is generally needed for environmental noise, the Noise Measurement Kit is the most common way to buy the Optimus Green. The Optimus Outdoor Noise Measurement Kit is ideal when you need to leave the meter unattended in poor weather conditions. 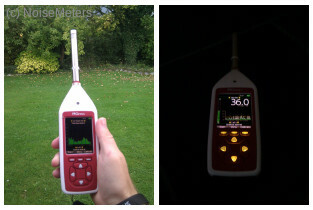 The sound level meter itself is not weatherproof and will be damaged by rainfall. The Outdoor Kit includes a weatherproof carrying case, outdoor microphone system and a battery pack to offer at least seven days of measurement. An optional extra battery pack will give up to fourteen days of noise measurement. With the standard microphone fitted, the Optimus will measure up to 140 dB (143 dB Peak). While this is adequate for almost all applications, there are occasions when it is necessary to go higher. Measuring gunshot and even extreme car sound systems can need more than the usual 140 dB limit. With the MK200EH High Level Noise Mic System the Optimus Green can measure up to 170 dB. Bluetooth BLE compatible with Android and iOS devices. Language options English, French, German, Spanish.